Because there are 14 teams, there are two pools of four, and two pools of three, each team in the latter two pools playing cross-pool games with the other three team pool. We’re going to look at the schedule one slot at time, breaking down each game and showing you which are the ones to pay attention to. The game serves as a good warmup game for Lone Star. Oklahoma did not perform well at Cowboy Cup III in November, unable to keep any of the four teams they played within snitch range. They may find a win sometime this weekend, but they will be finding it later rather than Sooner (Editor’s Note: Oh boy…). A rematch from both Wolf Pack Classic and Lonestar Cup II, A&M has previously dominated Texas’ second squad with scores of 140*-30 and 90*-0. I expect a similar result at Diamond Cup, with A&M having the superior chaser athleticism and strategy, along beaters who will maintain bludger control for all or most of the game. Another game being played for the third time this season, and another in which one team has taken both games. In their first matchup, LSU the mud at Wolf Pack Classic severely limited LSU’s aggressive beater play, leading to a score of 160*-50. But the rematch later in the day was one of my favorites of the tournament. On a dry field, LSU was able to play their game and held within rane snitch catch for a majority of the game, with Texas ending up winning, 120*-50. This weekend, many are predicting that, with a stacked chasing core reminiscent of the World Cup VI championship team, Texas will outplay a supposedly depleted LSU team. 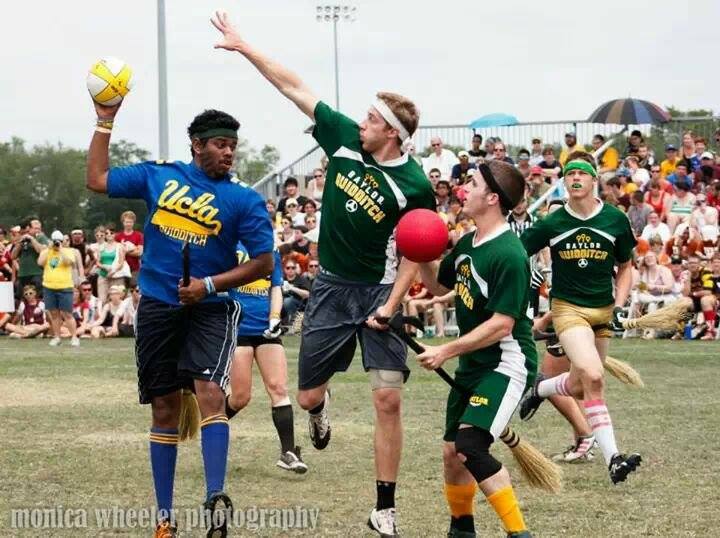 However, with the beating of Daniel “Juanito” Depaula and Jason “Col 3:17” Winn, the beater game will fall into LSU’s lap as they take on a talented, yet inexperienced beater set led by former Austin Quidditch star Freddy “Chuckwagon” Salinas. Expect a hard hitting game and some beautiful goals from these two teams to set the tone for the rest of the tournament. The first game of the day for the Bobcats should prove to be an easy one. With a myriad of superior athletes, Texas State should take this game on skill alone. The Silver Phoenixes have been an inconsistent team from game-to-game this season, and that lack of consistency will affect them in San Marcos on Saturday. Baylor’s first game of the day should provide them a nice warm-up before getting to the nitty gritty of their pool. North Texas will most likely struggle against Baylor in all facets of the game, but most notably in depth. “Tad, this is one of the top ranked teams in the nation versus a – usually – unranked team’s B team, how in the world is this a game to watch?” Well reader, UTSA has sustained heavy losses to injury and to LSQC. After Keeper Craig “Big Daddy” Garrison joined Lone Star, utility player Chris “A-1” Scholz and Jacob “Mondo” Wilson have also left the squad with intentions of joining the Texas community team in the near future. And with injuries, including now-starting beater, Abel “D-Day” Costilla, and the absence of Cullen “Super-C” Carter, UTSA will have not only a lack of physical depth but of skill depth as well. With Wilson and Costilla gone, they will be utilizing inexperienced beaters that have little to no playing time. On the other side of the pitch, you have the Sharknados. Most people would write them off as a low-tier B team, but the Sharknados are full of raw talent that, if cultivated, could amount to a stellar force. In fact, many of the players on the Sharknados are supposedly going to be moved up to varsity after the Regional Championship in Tulsa. If the Sharknados can hold their own long enough to wear UTSA out, it’s not impossible to think that this game has some upset potential. Here’s what the people want. This game is going to add a few cars to one hypetrain, and somewhat derail the other. Both teams are undefeated in official games, and both are going to be playing to prove which region is the best at this point in the season. The Lost Boys will be missing some key players, including Tony “The Truth” Rodriguez, Steve “Dirty D” Dicarlo and Jake “Ox” Tieman. They will also be missing a few others that, while not key pieces, are important to depth. Lost Boys are widely regarded as having the best beater set in the nation, featuring studs like Chris “Death Blow” Seto, Peter “Mantis” Lee and Amanda “Tater” Nagy. While I think they’ll give A&M’s beaters trouble for most of the game, especially with the absence of Rachel “Hurricane” Harrison, A&M’s physically dominating chaser defense, paired with that exemplary Southwest pass coverage, should be able to more than compensate for their beaters shortcomings, if any. It’ll be interesting to see how the small-framed Seto and Lee deal with the physicality and size of A&M’s male beaters, who average over six feet in height. On the chaser end of things, Alex “Big B” Browne and Jeff “Samurai” Lin will be trying to fill the gaps left by their absent teammates. I also wouldn’t be surprised to see Browne or Lin going for the snitch in tight situations with DiCarlo and Rodriguez absent. We saw this game just a week ago at the Bottom of the Bracket Invitational. In the quarterfinals, Austin took out the Osos, 120*-20. I’m sure the Bears of Death have learned from the experience, but I don’t think a week is going to be enough time for Baylor’s B team to progress to the point of beating the Bottom of the Bracket tournament champions. Even if the Sharknados are capable of upsetting UTSA, which I doubt, the North Texas Eagles won’t have a chance. Depth has always been a problem with the team, and coming into this game after a tough Baylor match, they will be no match for the just-as-not-deep-but-more-talented Roadrunners. UTSA should easily take this game and use it to pad their tournament seeding. Okay, I don’t expect this game to be an upset, but I do think it’ll be the more interesting of the two games in this time slot. Baylor has arguably the easiest pool of the top-tier teams, which should grant them the first seed in bracket play. This is a rematch from Lonestar Cup II, and it’ll be interesting to see how the Sharknados have developed since then. I don’t think this game is going to be a 220*-50 blowout like it was last time, and I won’t be surprised if the Sharknados put up a fight as Baylor pulls for a “perfect” 120-point differential to help secure that number one seeding. At full strength for the first time since their title run, we’ll get to see what Baylor has to offer this weekend. Credit: Monica Wheeler. This is a tasty rematch from Lonestar Cup II, which ended with a 150*-70 Lone Star victory. But this game could very well have upset potential, especially if Texas State has been progressing at the same rate as Lone Star. State will try to keep the game within range, utilizing players like Rich “Thoro” Kemp, Jordon ”Swaggy P” Parisher, and Ryan “ E-rupt” Peavler. 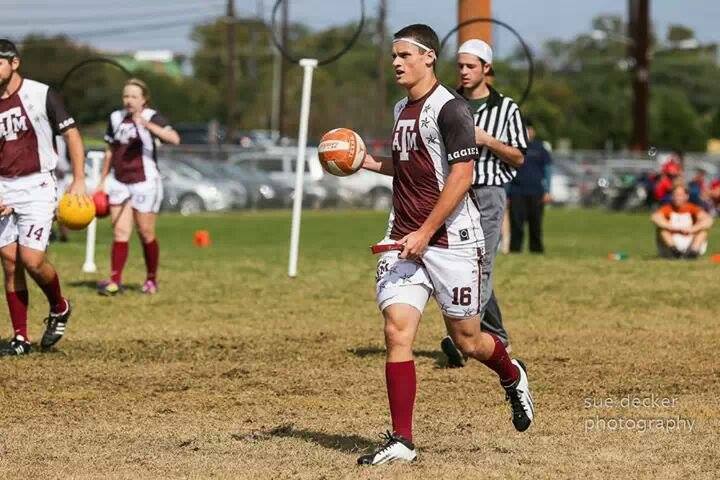 The first two are major contributors to the Bobcat offense, while Peavler and girlfriend Beth “Big Time” Clementi, will try to be the saving grace of Texas State quidditch by vying for bludger control against the obvious weakness of LSQC, their beaters. Standing in the way of the Texas State offense will be Stephen “King James” Bell, Chris “D.Wade” Morris, and the rest of Lone Star’s stacked chaser line. If Texas State can take advantage of their strengths in the beater department, I wouldn’t be surprised to see the Bobcats keep things in snitch range long enough for an upset. This is yet another rematch from Cowboy Cup III, in which Silver Phoenixes prevailed by a score of 120-10*. I have yet to see much of OU this season, but their lack of experience and depth makes me think they will continue to not put up much of a fight, especially at this tournament. With a little room to work with, expect Hunter “Big Saab” Stolte, Joseph “Gladiator” Hood and Justin “ChronicY2K1” Tepera to really connect and bring about a large point differential for the Silvery firebirds. They should be helped in their defensive endeavors by freshman beater Nick “Raybo” Askam, who’s fast on the take, scrappy, and should be able to dominate and frustrate the OU beaters. The fact that Texas is playing its own B-team in pool play is more than a bit unfortunate. 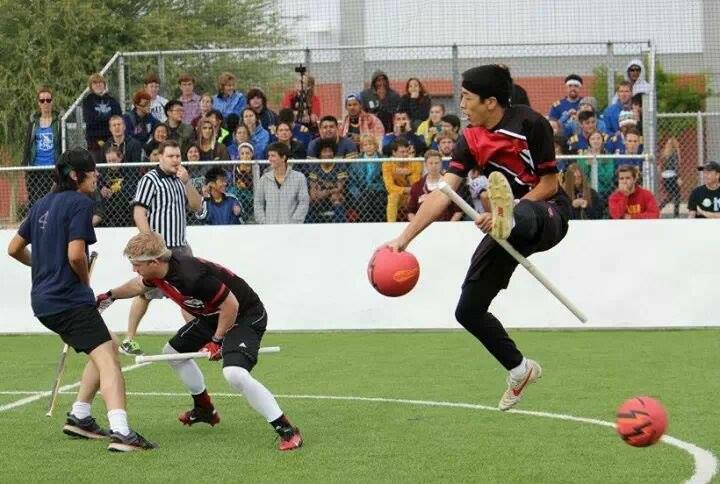 I don’t know if there will be any tension between these two teams as they face off, but either way it’ll be a fun game to watch, as most of the players have been playing against each other for a while in the Texas quidditch program. The Longhorns should win by a hefty margin, but Austin could definitely throw a wrench in Texas’ plans by keeping them from that 120-point differential, costing the Longhorns a better seeding. This should be a fairly close game at first, but Sharknado’s simply have the better strategy, more athleticism and more depth. The Eagles might pull off an upset in a shorter game, but if the San Marcos community team can play the defense they’re capable of, North Texas shouldn’t be too much of a threat. This game is really a chance for the Texas A&M to warm up against Baylor’s signature defense, as they will more than likely be playing Baylor in bracket play. Captain Bekah “Battle” Burroughs and Gabe “Double” Garcez will try their best to rally the morbid grizzlies and score a few points, but they will be overpowered by A&M’s up-tempo offense and devastatingly physical defense, led by Kifer “Champ” Gregoire and Drew “Hit Squad” Wasikowski, leading to a gig’em for the Aggies. If LSU had a full roster, this game would be an absolute nail biter. However, with the Tigers missing studs like Brad “Birdman” Armentor and Dennis “Doc” Arbour, they will struggle against the offensive chasings forces of Lin and Browne. Something to watch for in this matchup is the intense beater game. Both teams have a hyper-aggressive beater strategy that dismantles offenses, and with the two facing off this one could turn into utter chaos. In a massive rebuilding year, LSU definitely has a chance to take out the West favorites, as long as they can stay collected and not make too many errors in the absence of Armentor. I said earlier that Oklahoma may find a win later, rather than Sooner – still funny (Editor’s Note: Not really) – but I think I was wrong. This pool is nothing besides too competitive for Oklahoma to be able to keep up. Texas State should be able to boost their seeding from this game, which they may desperately need if Lone Star does as well as some people expect in their second game. This game shouldn’t be too much of a hassle for the team that’s gotten second at every official tournament they’ve been to so far. Silver’s raw talent will be a thorn in the paw of the Lone Star lion, with Askam and Hood doing as much damage as they can against this team of veterans. But it won’t be enough to even give the illusion of a chance at victory. This game is Baylor’s redemption from Breakfast Taco. There, they played a game at about 40% strength and suffered a lost to the Roadrunners that had people questioning the Bears’ chances this season. Now, the shoe is on the other foot, as UTSA is going to be hurting for depth and Baylor will do its best to take advantage of that. With UTSA lacking experienced beaters, expect the three-headed monster of Tim “The Jet” Brestowski, Chris “He Hate Me” Rhodes, and David “Big Merck” Gilbert to dominate the bludger game. This will allow Trent “Skip to My Lou” Miller, Jacob “ Jesus Shuttlesworth” Bruner, and the rest of the Bears offense to score easily on fast breaks with their signature precision passing. A chance for LSU to improve its point differential before seeding. Osos’ beaters won’t stand a chance against the Depaula-Winn duo, which will be a dominating factor in the game. If his beaters can give him any opportunities, Osos’ Garcez might be able to drive through for a few points, but, ultimately, this game is LSU’s to win and the Osos’ to learn from. Another great game to watch in the Lost Boys’ schedule of death. Depending on how the Longhorns decides to play against the Lost Boys, this could be their game to win or lose. If Texas’ beaters try to aggressively compete with the Lost Boys beaters, they will give up a fair amount of points to bludgerless situations. However, if the current world champions can play a conservative, yet effective, beater game, much in the way they did against UCLA last year, they can rely on their superior chaser core led by Augustine “The Big Ticket” Monroe to slowly rack up points against the California community team. Bludger control and depth are going to be the deciding factors for this game, and it’s going to come down to who can utilize them best.